When I ride, I daydream a lot…some of you can relate to that based on our recent article. I sometimes think back on all the fond memories I have had on or around bicycles, and I began to wonder if our readers would share some of theirs. Noah: I remember living in Nebraska, and upgrading from my first 12″ toddler bike to a 20″ Huffy Challenger BMX bike, and tackling a bunch of awesome dirt hills. I remember exploring the outskirts of town from sun-up to sun-down with my best friends, all by bicycle, and my parents didn’t freak out. I’d tell them of our adventures. As long as I was back home by the time the street lights came on, they were cool with it. No nanny-state for us as kids! The incoming generation of adults is going to be so messed up when they experience real life for the first time, without knee pads and safety harnesses. Know the glory of the Princess BEAST. Jack: So many of my memories of youth revolve around bikes…spending time in my grandfather’s garage/bike paradise, learning all the aspects of building and maintaining fine Italian machines at the hands of a man who approached his bicycles with the same care he took repairing Rolex and Omega watches (his “day job”). He taught me so much — including how to use a bench-mounted buffing wheel to polish up a beautiful pair of 1035 high-flange hubs just prior to him building a wheelset around them. I also remember spending a lot of time riding on the back of his tandem, with a brutally stiff Brooks saddle wedged into my nether regions. My most fond memory of him is the last bike ride we went on together: me, a teenager at the end of my lackluster road racing career, him in his mid 70s. After a leisurely 30-mile cruise, we decided to sprint back to the W&OD trailhead in Vienna, Virginia. The man dusted me like I was standing still. Humbling, to be sure. The most vivid bike memory for me, though, is the transition off training wheels. Early on that day, a practice session ended up with me sprawled over the hood of a parked car, cursing that blasted two-wheeled monstrosity. Later that day, after some gentle persuasion by my father, I had another go at it and suddenly, EVERYTHING CLICKED…the balance, the steering, the braking. I was free, and I was more excited than I had ever been before. Anyhow, enough memory-lane-action for us. Let’s hear YOUR stories, if you’re in the sharing mood. Just leave your comments below. I have lots of bicycle memories from childhood. As an adult, however, (being a super novice and generally lazy bicycle owner) I will relate when I got my first mountain bike. I was 32 and bought a Kona Fire Mountain from the local dealer. I was like a kid again. I rode by this enormously steep bank (probably 30-40 ft. high) between a major street and campus everyday on my way to the library. I was always afraid to try to ride down it because it ended at a curb and another road down below. Everyday I planned it out, when and how I would apply the brakes, what would I do if there was a car coming, how would I handle the curb… Then one day I timed it and shot down the embankment, hopping the curb at the end. This was not a major feat, by any stretch, but it was the first time that I really felt like the bike was a tool. I understood its capabilities and navigated a situation. Best of all, it was really fun. Dang. I think I’ll dust off my bike and go riding today. My fondest memory of bicycling was the day that I received my first multi-speed (10! )rigid-framed mountain bicycle. Up until that time I had only ridden on single speed BMX bikes and walking up the steep hills that surrounded my house was humiliating. It was huge, it was rugged, it would allow me to ride straight up brick walls and it was all mine! The ten seconds it took me to rip off the birthday ribbons and thank my parents were the only ten seconds that bike was clean. I immediately abandoned my birthday party (with friends in tow) and took off. As the sun was setting (several hours later) we returned bloody and caked in mud and totally convinced that not only had we mastered the local trails, but we had made them whimper and beg for mercy. That was easily one of the best days on a bicycle and even now when I spy a new trail, I get this wild look in my eye and the Mrs. gets a little nervous. One of my fondest bicycling memories, too, was when the training wheels came off. Dad felt it was time. I protested. Clearly having a bike remain upright on only two wheels was impossible. This pursuit was futile and pointless (although I don’t think 5-year-old me expressed it that way. I think it was “I don’t wanna!”). One parent running alongside and holding me up, the other a little ahead waiting to catch me during the inevitable fall. They swear they let go at one point and that I was under my own power and staying up unassisted. 5-year-old me has his doubts. The training wheels, however, will not get put back on, so my options are limited. Another dilemma: tomorrow Uncle Skip and Aunt Karen come to visit. I would love nothing better than to show off my bike-riding skills to Aunt Karen, if only I had any. The next morning I’m up early, no one to see, no one to push, no one to catch, and I practice. When Aunt Karen and Uncle Skip arrive, I am able to ride out to meet them. I rode a lot as a kid. We lived at the top of a hill, so when I left the driveway and the training wheels came off, there was A LOT to run into. I remember crashing my dad’s Sears ATB (my first full-size bike) at the age of 10 or so and him getting really angry about me breaking a bike he didn’t ride and having to go to a real bike shop to get it fixed. “Ben the destroyer”, he called me. Little did he know that eventually, I’d take up cycling anyway and break plenty of bikes of my own. I remember riding one summer afternoon in high school and ending up in the next town before turning back for home and getting back in the dark (with no lights and no helmet). Clear from Corona to El Cerrito and back. It was then that my dad had to set boundaries. 6th st., main st., and the hills. @Rob E: What determination you had! Practicing in secret in the morning by yourself, so awesomeeeeeeeeeee! My first bike was a 20″ single speed Huffy from Sears. I remember it was from Sears because it had a badge that said so. I once freaked out my Mom and Dad by riding it from my house to a good friend of mine who lived over 10 miles from my house. Anyway that was my start and yes I started with training wheels which for some reason my Dad did not take them off for me. He told me that if I didn’t want them on here is the wrench go take them off yourself so I did. It was not easy riding in my neighborhood due to the sandy dirt roads that we lived on. My next bike after that one was a mountain bike with 24″ wheels which was a big deal at the age of 12 all the kids had one. This was a beast of a bike and took me a while to learn to ride it. Shortly after that we (My Mom & Dad and 4 younger borthers) moved to my Grandparents horse ranch where we invented a new game. We would chase each other some on horseback (aka cowboys) some on bikes (aka Indians) through out the 100’s of acres of woods behind my grandparents 65 acre ranch. It was a lot of fun and I learned really good bike skills. We had all kinds of bikes back then MTB’s, BMX, Multi-gear, single speed, fixed gear (we didn’t call it that it was just the bike no one wanted to be stuck with) and a kick back 3 speed which was a pain to ride because it was hard to get it to shift properly. Anyway these are the memories I have as a child riding and after almost 15-20 years of not riding bikes I am now a avid bike commuter using my bikes to go almost everywhere and do everything. I would say it is a way of life for me now. I just which I had instilled this into my kids and given the ideas of living simply. Today my kids sadly do not consider bicycles as a mode of transportation however I am trying to change their views and intend to give bikes as gifts to my grandkids so hopefully they will see them as a way of life and secure their future. I guess cycling skips generations because my grand parents and my dads uncle used bicycles as transportation where my parents just see them as toys. Hopefully now that they see me using bicycles to commute will see them as more than that. At least that is my goal in the second part of my life. Anyway sorry for my ramblings and the last part being a little off topic. I just think that the fact that our parents gave us bikes and that early freedom of being able to go places without having them take us there gave us this idea that bicycles are a way to get around where others that did not get bikes at young ages prob. do not see them the same way. So I leave you with this, teach your kids that bikes are a mode of transportation and much more than just a toy and think they will be better off for that. 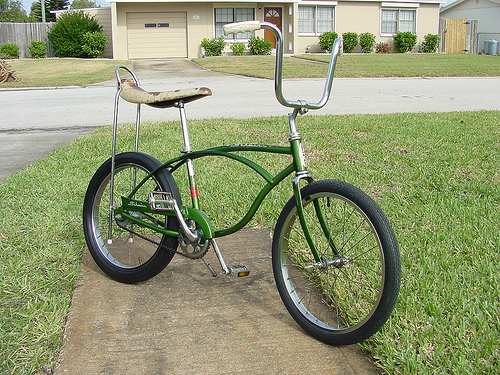 Th first bike I remember was a green Schwinn Stingray. I was so proud of that bike. I cruised around the block and through empty lots in West LA when I was 8 years old then the streets, parking lots, and dirt tracks in the woods of suburban St. Louis, MO. It served me well until my first “10 speed bike” – a Motobecane Mirage.